Author note: This salad is the ideal packed lunch. It is good cold, slightly heated or even at room temperature. I use a jarred harissa sauce, Mina Harissa for the Spicy Harissa Yogurt. 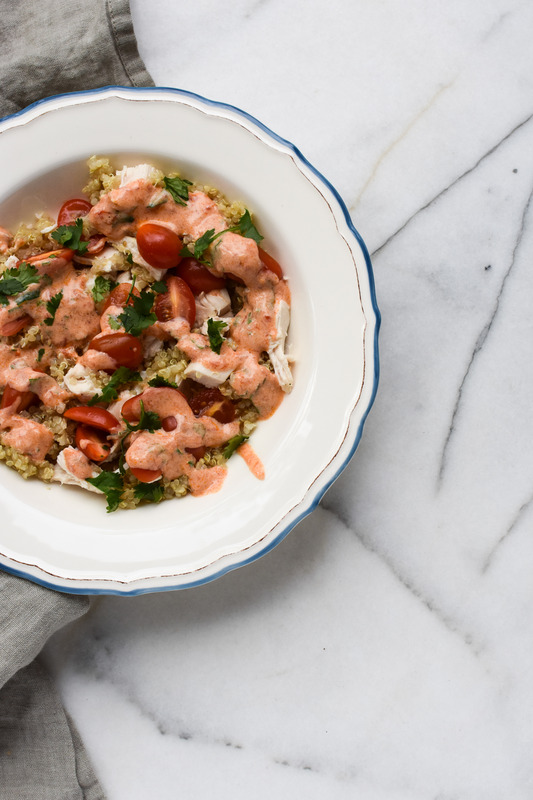 Combine quinoa, spicy harissa yogurt, chicken, tomatoes, lemon juice and salt in a medium-sized bowl and stir well to combine. Top each serving with cilantro. Add all ingredients in a small bowl and stir well to combine. Refrigerate 30 minutes prior to serving. This entry was tagged chicken, cook, lunch, quinoa, recipe. Bookmark the permalink.